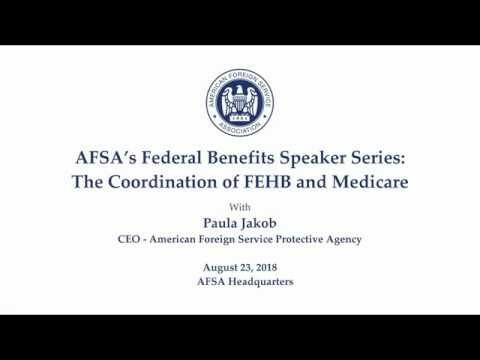 Paula Jakub is Chief Executive Officer and Executive Vice President of the American Foreign Service Protective Association (AFSPA). The Association administers the Foreign Service Benefit Plan. She is formally recognized as a Subject Matter Expert in Federal Health Benefits by the Foreign Service Institute, where she serves on the adjunct faculty. She is also the Executive Director of the Senior Living Foundation of the American Foreign Service, an organization solely devoted to helping elderly Foreign Service retirees and surviving spouses. This entry was posted in medicare supplement and tagged AFSA, FEHB, Foreign Service, health plan, medicare. Bookmark the permalink. Questions at the end are not audible.